The size and strength of the wrists is often overlooked, even by people who spend a lot of time in the gym. Specifically, working out the wrists can build muscle on them and make them larger. It can also help improve forearm and grip strength and help people do exercises like the bench press where the wrists can often fail before the target muscles do. Lever lifts are popular with arm wrestlers for developing the wrists and forearms. Use either a dumbbell bar with a weight plate on one end or an object like a sledgehammer that has a weighted end and an area for gripping on the other end. Standing up straight, hold the handle area with your arm extended at your side. Let the weight hang in front of you. Pivot at the wrist to lift the weighted end as high as you can and return to the starting position. Repeat to exhaustion. For variation, do a similar exercise with the weight facing behind you and pivot the wrist back. Take a seat and lay your forearms on your lap and hold a barbell palms up. Use just your hands and wrists to curl the barbell as high as possible. Return to the starting position, allowing the barbell to roll into the hooked area of your finger tips. Repeat to exhaustion. 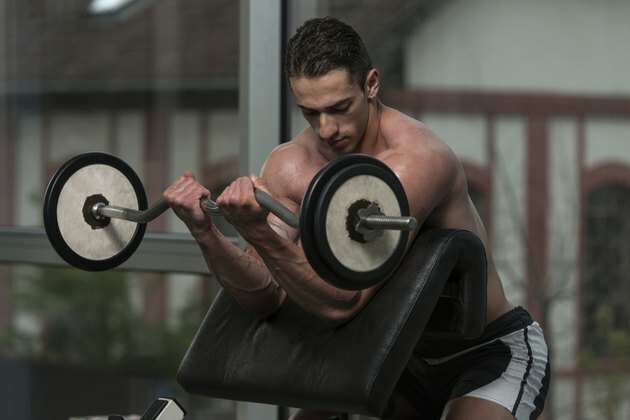 Sit with your forearms on your lap and hold a barbell palms down. Use your hands and wrists to pull the bar up as high as you can. Return to the starting position and repeat to exhaustion. A forearm developer is a simple piece of equipment that is made of a dowel connected to a chain or rope in the middle that hangs below and connects to a weight. Hold the dowel with an overhand grip and roll it forward, pulling up the chain or rope. When the weight reaches the dowel, slowly unroll it. Repeat until exhaustion. Stand with a barbell behind your back. It should be rolled down into the hooked area of your fingers. Raise and close your hands and roll the bar into your palms. Pause, then steadily return the starting position. Repeat until exhaustion. Hang two towels evenly on a pull-up bar at shoulder width. Grab each towel with palms facing and thumbs pointing up. Perform pull-ups to exhaustion. This exercise also works the back, biceps and forearms.